If you’re in the market for a cost-efficient compact Chevy, your local Lexington car dealerships have plenty to choose from. Here, we’ve spotlighted three Chevy models for your to consider, each one is an ideal used car purchase. Although there are many used Chevy models that are cost-efficient, while still being reliable, comfortable, and capable, these three are also routinely cited by automotive experts and industry publications for their value, performance, and dependability. Targeting the 2013 model year for even comparison, the Chevy Cruze, Sonic, and Spark are outstanding options for your used car purchase. A small bowtie sedan, the 2013 Chevy Cruze was released in four trim levels: the LS, Eco, LT, and LTZ, with a range of standard and available options offered between them. Powertrains came from a 1.8-liter inlinefout-cylinder engine, rated at 138 horsepower and 125 lb.-ft. of torque, as seen on the base model, four-wheel-drive 2013 Chevy Cruze LS. A turbocharged 1.4-liter inline four-cylinder, which generates 138 horsepower and 148 lb.-ft. of torque outfits the Eco, LT, and LTZ models. The LS, LT, and LTZ trim levels, are all operated by standard front-wheel drive and a six-speed manual transmission, while the LTZ comes standard with the six-speed automatic transmission – an optional feature on the other three trims. Although this isn’t the zippiest compact car on the market – Edmunds measured the 2013 Chevy Cruze in the zero to sixty mph sprint at 9.2 seconds – it is celebrated for its fuel economy, particularly with respect to the Eco model, which returns a 28/42/33 mpg rating from its manual setup and 26/39/31 mpg with the automatic. While the 2013 Chevy Cruze might not have set any records for speed, it’s braking power is better than most of its rivals, able to come to a full stop from 60 mph in 122 feet. Partly because of this, and the variety of standard and available safety features, the 2013 Chevy Cruze received top safety ratings from both government testing and the Insurance Institute for Highway Safety. Noted for its comfort, responsiveness, and styling details like two-tone color schemes, the 2013 Chevy Cruze is an excellent car for commuters, first-time driver, or anyone just looking for a reliable set of wheels at an affordable price. Originally set at the MSRP of $17,130, you’re sure to find great deals from this model year at your local Lexington car dealerships. Part of the appeal of the 2013 model year with respect to the Chevy Sonic is that this year brought some important enhancements to the car, like Bluetooth technology, blind-spot mirrors, and the upgraded Chevy MyLink infotainment group, which provides navigation and smartphone integration. Although it’s considered a subcompact car, the 2013 Chevy Sonic comfortably seats five passengers in either the sedan or hatchback. While both models come in three trim levels: the LS, the LT, and the LTZ, the hatchback also offers the new-for-2013 RS, which is a performance, sport-tuned variant, equipped with a 1.4-liter turbocharged engine, which gets 138 horsepower, but a boost of torque at 148 lb.-ft.
Where the 2013 Chevy Cruze was missing some zip, the 2013 Chevy Sonic RS picks up the slack and runs with itâ€¦literally. According to Edmunds, the hatchback RS, equipped with a manual transmission, dashed from zero to sixty mph in 8.8 seconds – giving it the distinction of being the quickest among its same-class competitors. Just as safe as the 2013 Chevy Cruze, the 2013 Chevy Sonic also earned top safety ratings, and was initially priced to start between $14,185 – $21,470; however, the average purchase price has been reported as ranging from $10,922 – $15,536. With those reports about a year old at this point, you’re likely to find even sweeter deals on the 2013 Chevy Cruze from the lot at your Lexington car dealership. Completely revised for the 2013 model year, the Chevy Spark is the ultimate city car when it comes to size and serious fuel efficiency. It’s also the tiniest of this trio, a whole fourteen inches shorter than its sibling, the Chevy Sonic. That said, this is a hatchback that can still seat four passengers comfortably. Available in three trim levels: the LS, the 1LT, and the 2LT, the 2013 Chevy Spark is equipped the same between those three. Featuring a 1.2-liter four-cylinder engine, this Spark only generates 84 horsepower and 83 lb.-ft. of torque, operated by either a standard five-speed manual transmission, or the four-speed automatic transmission as an option. Fuel economy is where the Spark really shines, estimated by the EPA to get 32/38/34 mpg with the manual equipment and 28/37/32 mpg from the automatic. 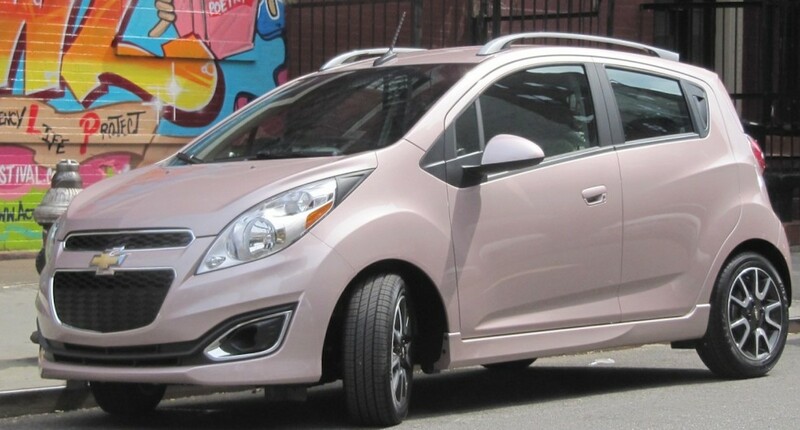 In addition to enviable fuel economy, you can really make an impression by driving a 2013 Chevy Spark. Just consider the color options, which range from conservative to more eye-popping, and actually kind of err on the eye-popping end of the spectrum. Choose from Black Granite, Techno Pink, Lemonade, Denim, Jalapeno, Salsa, Summit White, or Silver Ice, and treat those city streets to some eye candy. About that ultra-affordability, the 2013 Chevy Spark was super affordable when it was released with the sticker asking between $12,185 – $16,010. Recent used car reports list the average price paid now between $10,458 – $12,978. Check in with your nearby Lexington car dealership, where the sales and customer service specialists are ready to share their Chevy expertise in order to help you track down the most cost-efficient compact Chevy, without sacrificing any of your preferences. As affordable as these triplets were when they were released as new vehicles in 2013, imagine how affordable a used version is today. Helping you find that used version is what the team at your Lexington car dealership is trained to do.